With its 28 Member States and its 510 million inhabitants the European Union is the world's leading economic power. The euro is the second reserve currency. And yet Europe is too often criticised for the vicissitudes of its construction. So that in the end it remains greatly misunderstood. This Atlas of the European Union is an introductory work of reference to the Union, its institutions, each of its Member States and their overseas territories, via their history, their culture and their reality. With over 50 maps, original information sheets and summarised statistics, it offers a unique portrait of Europe that is accessible to the widest audience. It is a vital tool to learn about and understand the issues at stake in the 21st century and the challenges that Europe faces in a world undergoing deep change. Drafted by experts at the Robert Schuman Foundation - one of the leading think-tanks devoted to Europe - this book provides easy access to information about Europe. 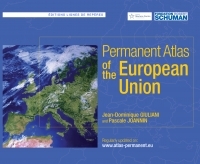 A unique innovation it is permanent, meaning that via free access to the website www.atlas-permanent.eu, its content is regularly updated so that everyone has at his or her fingertips the most up-to-date information on a constantly evolving Europe. Jean-Dominique GIULIANI and Pascale JOANNIN are respectively the Chairman and General Manager of the Robert Schuman Foundation. This English edition is supported by the Wilfried Martens Centre for European Studies.